One of the most celebrated individuals of English literature, Samuel Johnson (1709-84) was a defining figure of his age. 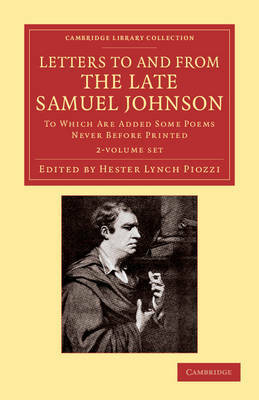 In addition to his celebrated labours as a lexicographer, Johnson distinguished himself as a poet, essayist, critic, biographer and editor. The writer and society hostess Hester Lynch Piozzi (1741-1821) was an unconventional woman of great intellectual vivacity. She became a close friend of Johnson, whom she met through her first husband, the brewer Henry Thrale, whose ailing business Johnson did much to support. As well as writing essays, poetry, memoirs and travel diaries, she was one of the first women to produce works on philology and history. First published in 1788 - two years after her groundbreaking Anecdotes of the Late Samuel Johnson, which anticipated Boswell's biography - these letters offer a captivating glimpse into their daily lives and concerns. The volumes cover the periods 1765-77 and 1777-84 respectively.